Is there a ‘crash position’? Global warming is accelerating beyond the worst nightmares of earlier IPCC reports. We are fast approaching many feedback loops or tipping points where nature starts to emit more greenhouse gases than all the carbon us humans have added. Our car is now rolling down the hill all by itself. Has it already gone over the cliff? 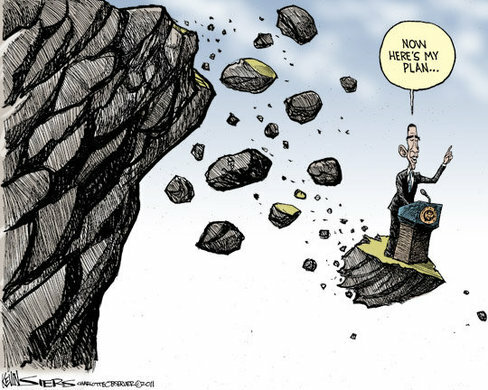 This cartoon of Obama probably showed him flying off a proverbial fiscal crisis. But what is the climate cliff, and have we already flown off the edge? As global warming accelerates towards the climate cliff, what do we do? Well, we start pushing faster! We are exponentially increasing our carbon emissions. Think Progress reports on the recent studies that show we could be much closer to the climate cliff than even the most urgent warnings from the last IPCC report! Even to have a reasonable prospect of getting to a 4°C scenario would imply nearly quadrupling the current rate of decarbonisation. 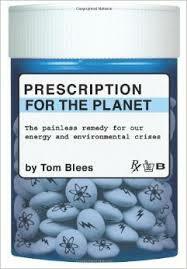 We need to multiply our carbon reducing programs by a factor of 4, but instead look what’s really happening. The new data from the Global Carbon Project found greenhouse gas emissions are expected to have risen 2.6 per cent by the end of this year, on top of a 3 per cent rise in 2011. Since 1990, the reference year for the Kyoto Protocol, emissions have increased 54 per cent. It means that the goal of the Doha talks – to hold global temperature rise to 2 degrees – is almost out of reach. That goal requires that emissions peak now and start falling significantly within eight years. “Unless we change current emissions trends, this year is set to reach 36 billion tonnes of carbon dioxide from the combustion of fossil fuels, we are on the way to an unrecognisable planet of 4 to 6 degrees warmer by the end of this century,” said the executive director of the Global Carbon Project, Dr Pep Canadell. It has been decades since the Kyoto Protocol, but annual emissions are still rising. The recent growth in Shale Oil gas has America addicted to not only the energy security it provides but the jobs it creates. Many Americans are still sadly blinded by red-neck politics to the scientific consensus about Global Warming and scoff at the best peer-reviewed science we have on the subject. American Presidential Candidates are almost frightened to comment on the subject. China says its emissions will keep rising until its per capita GDP is around five times its current rate, further dampening hopes that the world’s largest polluter will agree in principle to ambitious binding emission reduction targets at this month’s Doha Climate Change Summit. Heading into the conference, Xie Zhenhua, China’s chief negotiator, told state news agency Xinhua it would be unfair and unreasonable to expect the county to make absolute cuts in emissions when its per capita GDP stands at $5,000. He said emissions peaked in Western countries when their per capita GDP was between $40,000 and $50,000 and China’s were still climbing towards that point. Given that American’s use 20% of the world’s oil but have only 5% of the world’s population, and have emitted far more Co2 on a per capita basis than China, it’s easy to see why they are reluctant to place harsher limits on their economy than us Westerners are on ours! These political realities and stalemates have always plagued the Kyoto Protocol, and burned out many activists. No wonder many turn to doomer eco-cide websites, or run off to set up survivalist perma-culture villages. The car is now rolling towards the cliff, so we start running behind it, pushing harder! The climate is already starting to roll along down towards the cliff on its own. The thaw and release of carbon currently frozen in permafrost will increase atmospheric CO2 concentrations and amplify surface warming to initiate a positive permafrost carbon feedback (PCF) on climate…. [Our] estimate may be low becauseit does not account for amplified surface warming due to the PCF itself…. We predict that the PCF will change the arctic from a carbon sink to a source after the mid-2020s and is strong enough to cancel 42-88% of the total global land sink. The thaw and decay of permafrost carbon is irreversible and accounting for the PCF will require larger reductions in fossil fuel emissions to reach a target atmospheric CO2 concentration. Oh yeah, and how seriously is the IPCC taking all this? They’re not. They plan to ignore methane feedbacks in the next report. For more, see the Arctic Methane Release wiki. 2: Rainforest drying: As the Climate Change Feedbacks wiki says, rainforests that do not get as much rain may tend to be replaced by drier ecosystems that do not contain as much carbon in the trees or soils. Once again, there is a lot of stored carbon in rainforest soils. 3: Shrinking polar ice and glaciers: Yes the winter ice grows back over the North Pole each year. Yes, ships will be able to glide across the North Pole soon, saving shipping companies lots of money. No, this is not a good thing. As the globe warms and the Arctic ice thins and finally breaks up all summer, the ocean there goes from reflecting 90% of the sunlight off the water to absorbing 90% of the sunlight. The North Pole ice acts as a huge mirror, reflecting sunlight back into space before it can hit something with a low enough ‘albedo’ to be converted into heat energy. But when that mirror is gone, the sunlight will hit the very low albedo oceans and warm them. This, in turn, helps warm both Greenland’s massive ice shelf which could raise sea-levels, and warms the permafrost more, speeding up the methane bomb. 4: Increased water vapour: Warmer air carries more water vapour, which is itself a powerful greenhouse gas. See the Water Vapour wiki for more. There are so many feedbacks that James Hansen has even speculated that we could hit Runaway Climate Change that could see the Earth turn into Venus. John Houghton has said that there is no possibility that this will happen, but that’s not the point. Both authors agree that Global Warming is one of the most clear and present dangers to modern civilisation and we are simply ignoring it. No, we are DEFYING IT! We’re slamming on the accelerator! So what does all of this mean? What can we look forward to if we shove the car over the cliff? Of course, planning for 4°C [7°F] in 2100 — let alone 6°C [11°F] — is tantamount to planning for the end of civilization as we know it (see this review of more than 60 recent studies — “An Illustrated Guide to the Science of Global Warming Impacts: How We Know Inaction Is the Gravest Threat Humanity Faces“). And most importantly, a 4°C world is so different from the current one that it comes with high uncertainty and new risks that threaten our ability to anticipate and plan for future adaptation needs. The lack of action on climate change not only risks putting prosperity out of reach of millions of people in the developing world, it threatens to roll back decades of sustainable development. It is clear that we already know a great deal about the threat before us. The science is unequivocal that humans are the cause of global warming, and major changes are already being observed: global mean warming is 0.8°C above pre industrial levels; oceans have warmed by 0.09°C since the 1950s and are acidifying; sea levels rose by about 20 cm since pre-industrial times and are now rising at 3.2 cm per decade; an exceptional number of extreme heat waves occurred in the last decade; major food crop growing areas are increasingly affected by drought. Despite the global community’s best intentions to keep global warming below a 2°C increase above pre-industrial climate, higher levels of warming are increasingly likely. Scientists agree that countries’ current United Nations Framework Convention on Climate Change emission pledges and commitments would most likely result in 3.5 to 4°C warming. And the longer those pledges remain unmet, the more likely a 4°C world becomes. Even with the current mitigation commitments and pledges fully implemented, there is roughly a 20 percent likelihood of exceeding 4°C by 2100. If they are not met, a warming of 4°C could occur as early as the 2060s. Such a warming level and associated sea-level rise of 0.5 to 1 meter, or more, by 2100 would not be the end point: a further warming to levels over 6°C, with several meters of sea-level rise, would likely occur over the following centuries. The Conversation says: Are you ready for a 4 degree world? 5. If we go over the cliff — is there a ‘crash position’? If we go over the cliff, did we install crash bags? Is there a tree we can grab on the way down? What is our ‘crash position’? I hope we are not there yet. I hope we can slam on the breaks, stop burning fossil fuels, and let the planet cool itself down. But is what is the crash position if we have already gone over the edge? Now I’ll cover the whacky world of geo-engineering: restoring our climate by re-engineering it!